1) “Stayfocusd” by Google. I never thought of myself as a procrastinator. But a daydreamer, yes. Sometimes I just have too many ideas on the brain, about too many aspects of my life. Swimming around up there are always thoughts of the future, ideas for my creative hobbies, and names of dear people to write to or call. This results in me losing my train of thought, and turning to my email and Facebook way more often than I would like. The solution was introduced to me just two weeks ago by a fellow PhD student in our department. The premise is simple: Stayfocusd helps you increase your productivity by decreasing the amount of time you spend perusing websites that distract you from your work. And yes, for free. You set your work hours, list the websites you know you’re shamefully addicted to, and a maximum allowed time within your work hours where Google grants you the permission to come out of your writing bubble (with a clock ticking steadily away as you do so, though). If you exceed your time, Google guilt-trips you with, “Shouldn’t you be working?” and blocks the forbidden sites for the rest of the workday. If you try to change your settings in a desperate need to procrastinate, Google challenges you, making you do ridiculous things like type out long passages without a single typo (without copy-pasting! ), and lectures you repeatedly on the dangers of procrastination. Try it — it’ll change the way you approach work, and will instill the idea that there is a time and a place for everything, and right now it’s time to sit down and write. 2) A calendar of goals. This really helps me overcome the “what do I do next?” feeling that sometimes causes me to drift from task to task. Two weeks ago, I made myself a writing calendar up until Christmas break. Other than a couple of slots a week which are dedicated to data analysis, meetings or extracurricular activities, all other days have been assigned a section of my dissertation to work on. In pencil – because unexpected things do happen and we should ultimately be forgiving with ourselves – but it’s there, charcoal on white. Every week or so, there is a deadline. My supervisor has a list of these deadlines. He won’t remember them or check them, but I know he has them, and that pushes me to stay true to my “promises”! If you do make a calendar of goals, be realistic. You won’t write a whole introduction to a paper in two days. You also need to factor in time to find articles, read articles, fill gaps here and there, run more statistics, revise, edit, and so on. 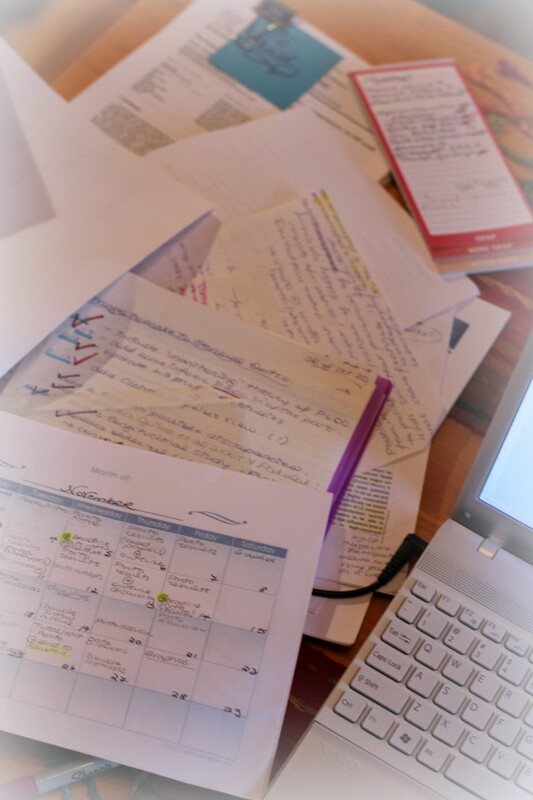 My writing calendar, a plan in steps, and articles to read – organized chaos! 3) Toggl. To overcome the disastrous problem of underestimating how long things take you, Toggl is here for you. Essentially, Toggl is a timesheet. An interactive one where you can specify your various tasks and start/stop a clock each time you work on that task. It keeps you on target, because you’re not going to check Facebook every 0.276 seconds when Toggl is logging the time it takes you to read a stack of papers. And it serves as a reality check that will help you set reasonable goals and deadlines, and reduce the number of over-commitments and false promises you make! 4) A highlighting or color-coding system. This is my favorite. The main purpose of this is to KEEP YOU MOVING FORWARD. This is the method I would like to call, “How to write a thesis while shutting up your innate (insane) perfectionism”. Think of the writing process as circular rather than linear. Here is my system: Write. Highlight missing references in red. Highlight to-be-updated references in blue. Highlight non-perfect-just-spat-it-out sentences in green. Highlight sections that are lacking “meat” in bright yellow. Keep writing. Perfect the green sentences next time you open the file. Look for the missing references when you have the time. I assure you that, despite the unsettlingly colorful file staring back at you (a Professor of mine compared it to a Christmas tree), this method keeps you moving forward. 5) A plan, in steps. When I am getting closer to finishing a section, I summarize all the red and blue and yellow (i.e., incomplete) passages on a separate to-do list – gaps to fill before this section is deemed DONE. This really helps me feel like I know what to do next. Moreover, I can pick and choose from a list which gives me some procrastination-room (it’s easier to track down missing references than to add a whole section to your paper). And, best of all, it is insanely gratifying to see a series of checkmarks and to conclude that your work here is done. 6) A folder for your articles. This helps stay organized if you have many papers to write (and different literature to synthesize). I like to keep articles for a particular paper together, sometimes along with my outline of that paper, and random ideas or notes for myself stapled to the folder for future use. Organizing the space around me is like organizing the space inside my head. The less clutter, the easier it is for the words to find their way out! 7) A list of “things to be thought through”. I started doing this last week, when I realized that things I read often sparked questions like, “Do I agree with this?” and “Does this apply for my studies?” It’s difficult and sometimes discouraging when you get hung up on these questions (usually on what your findings say or can’t say) and you know you have to think these complex ideas through for your papers and, eventually, your defense. I have started making myself a list of these thoughts (because I will naturally forget where I read what, and which were the doubts or questions I had), and I have it pinned to my wall at the office. 8) A list of “future directions”. Also pinned to my wall above my desk is a list of my “brilliant” ideas for future directions (usually mirroring the shortcomings of my current work!). Again, it’s one way to keep track of all those ideas floating inside your head as you read and think and write for days on end. 9) A list of consistencies in spelling or terminology to apply and check throughout. I’ve noticed that I tend to use a lot of hyphens to compound words together when I write. I’ve also noticed that I am incredibly inconsistent with this habit, sometimes hyphenating, sometimes not. Related to this is my habit of sometimes italicizing, and sometimes neglecting to do so. Terminologies used throughout a dissertation also have to be consistent, so as not to confuse the readers. But how to keep track of all that in a 200-page document? A list of the decisions I make is also pinned above my desk (boy, I have very little wall space left!) and I plan to check my document for any inconsistencies at the very end. 10) Thesaurus.com. My greatest love. What would I do without a digital thesaurus that basically tells me what word I really meant to use but struggled to fish out of my head? Helping diversify vocabulary and reduce repetition since the dawn of time (or shortly thereafter), a thesaurus also helps cure that pesky tip-of-the-tongue phenomenon that plagues even the most literary individuals among us! 11) Google fight.com. 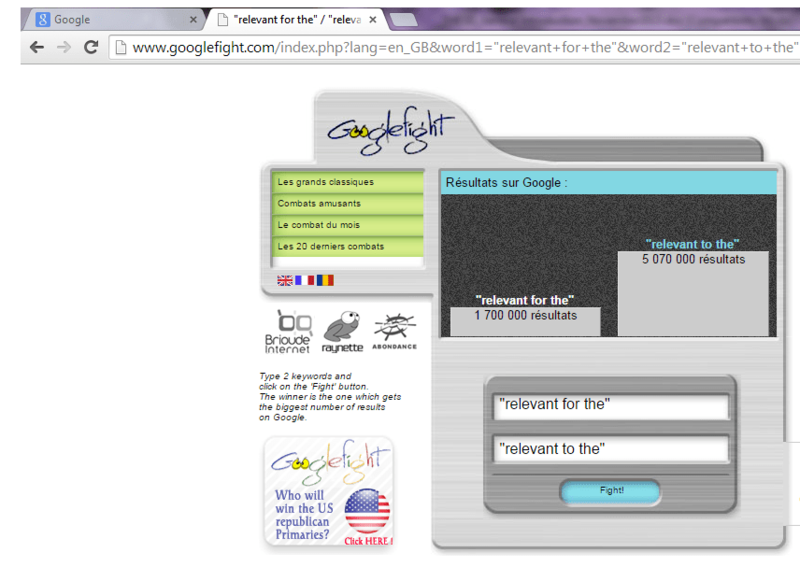 I don’t remember when I discovered GoogleFight, but it competes with thesaurus.com for the title of ‘best friend’. How many times do you have urges to ask things like, “Is it relevant FOR the, or relevant TO the?”. Well, in case you don’t have an English grammar teacher in the comfort of your own home (or even in cases where you do – take it from me – they don’t always have the answers either! ), Google Fight basically tells you what sounds better. What it does is that it checks the frequency of occurrence of a particular word or expression (use quotation marks for best results!) and, since correctness in language is defined by how language is presently used, then the most frequent option is probably your best bet. Why it’s called GoogleFIGHT is something you should check out for yourself — another reason I love this tool is that it adds a little bit of humor to the day. 12) A motivational quote. Disciplinal strategies and tools aside, writing is hard. Why? Because you are basically rummaging through your head to find what you want to say and the perfectly precise words to say it in. That messy process is additionally complicated by all sorts of other fears, exhaustion, worry, anxiety about deadlines or rejections, feelings of inadequacy, and random thoughts that manage to peak through while you sit there debating which preposition to use (“What to make for supper?” Hey, Stayfocusd can’t block everything!). 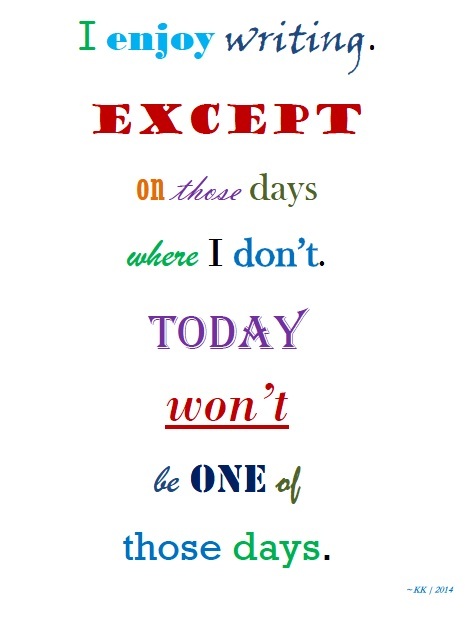 A motivational quote on a post-it stuck to your computer or pinned to your wall (poor wall) may help. My motivational statement is actually my own quote – not because I am pretentious enough to go around quoting myself, but because this is exactly what I told my husband one day, and I decided that my own voice would probably be my best motivator. 13) A bottle of water. I have always found that repetitive habits (such as chewing gum, transporting palmfuls of popcorn from a bowl to your mouth without even stopping to breathe, and biting all your nails off) are a necessary part of the writing process. What else are you supposed to do while the wheels in your head turn? Drink water! Sipping water is repetitive enough and a much healthier alternative. It’s good to keep that busy brain hydrated, too. 14) Oodles of patience and determination. When the going gets tough, just stay seated. My supervisor’s advice was really the best of all. Sit down and keep at it. Be patient and not too hard on yourself on days where it’s really a struggle to string words together. But keep determined. And, hopefully, the darn Thesis will be ready before forever comes. Vital. This is VITAL information, Kristina! Thank you! I’m grateful for your generosity and for taking the time to share all of your experiences with us. You are stellar. Thank yoooou!